This towed mobile unit is staffed and resourced with a canopy, outdoor seating and tables, growing activities, and cooking equipment, as well as information, plants, and starter growing kits. The Pod injects enthusiastic support, the sharing of skills, and offers training workshops and practical advice for people starting out with vegetable growing. Events such as The Flame, Dewsbury on Sea, Greenhead Park and Mirfield Show have found that this mobile unit provides practical, ‘characterful’ support to community events. The Pod increases footfall through being a unusual focal point and is suitable for any event either indoors or outdoors. The Pod can be hired by the day or week by Council departments, health centres. GP surgeries, libraries, sure start centres, schools, allotment sites, Parish councils, and local businesses for events, festivals or health promotion. 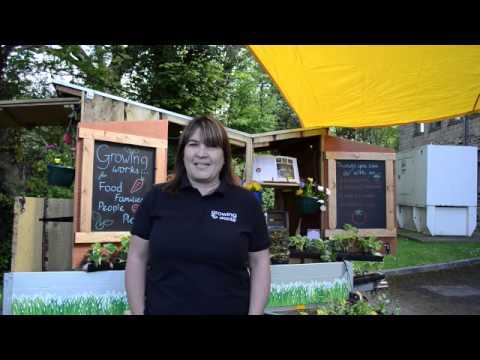 Quote: “I am very glad to say that the Holme Valley Gardening Network is a source of both inspiration and support to HoTT.” Chair, Holmfirth Transition Town.